Image Credit: Cliff Hollis, ECU News Services. East Carolina University (ECU) has become the first of 17 campuses within the University of North Carolina (UNC) system to use virtual and mixed reality to train future K–12 teachers. 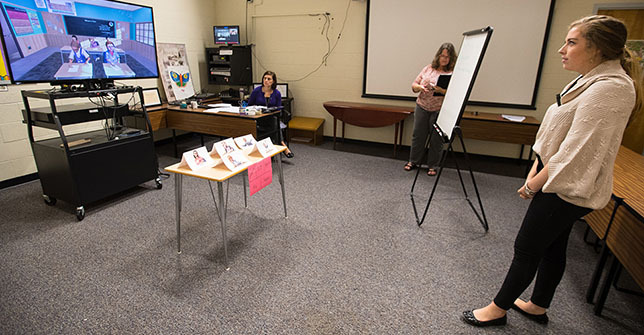 Students within ECU’s College of Education are currently using a virtual reality program that simulates a typical classroom environment, giving students the opportunity to practice classroom management techniques and instructional strategies. Last spring, the College of Education launched a pilot program using Mursion, which features a classroom of virtual students that mimic real student behaviors. Mursion works by using a combination of artificial intelligence and live actors to deliver personalized simulations. The student avatars, for example, have a range of personalities, “from the first-to-raise-their-hand to the distracted shy student,” according to a report from ECU News Services. ECU students do not wear headsets or other devices with the technology, the university told Campus Technology. Instead, students stand in front of a large screen that projects a virtual classroom. They can interact with the avatars, receiving immediate feedback from both peers and instructors. Additionally, the program provides “easy-to-capture analytics that can inform future training plans,” according to the company’s website. To learn more, watch the video demonstration below, or visit the ECU News site.